Karyn Olivier’s The Battle Is Joined was a response to the Battle of Germantown Memorial, a twenty-foot-high monument built in Vernon Park in 1903 and dedicated to a Revolutionary War skirmish between American and British troops in a former colonial settlement. Today, Germantown is a predominantly African American, working-class neighborhood in the city. 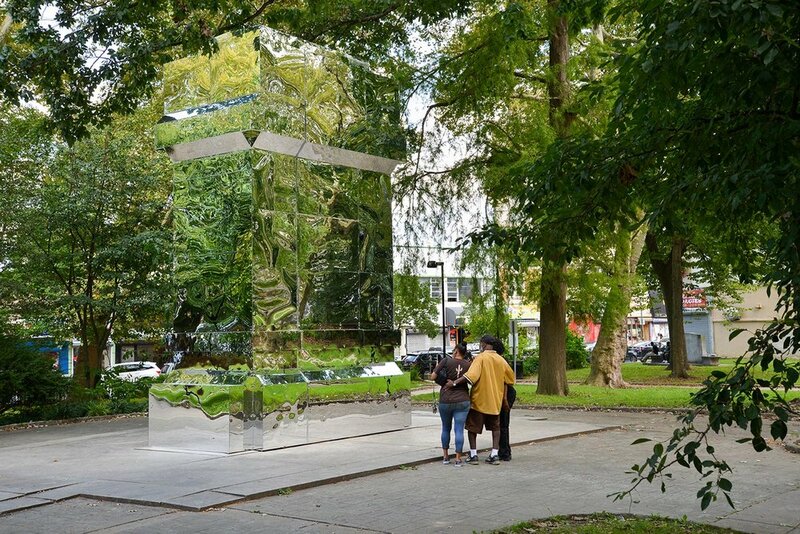 Olivier built out an acrylic mirror encasement that covered the monument as a way to bring people closer to one another, to their surroundings, and to their living histories. The Battle Is Joined also referenced another monument in Vernon Park, one designed by Albert Jaegers and dedicated to Francis Daniel Pastorius, a German settler who led a Quaker protest against slavery in 1688. The construction of Jaegers’s monument to Pastorius began in 1908, but during World War I, one of its sponsors, the United States War Department, boxed over the structure. During World War II, the statue was again boxed and removed from public view. Olivier’s enclosure extended this history, engaging the site of the park as a space to question inherited symbols from the past and envision new modes of interpretation. The Battle is Joined was recognized by the Americans for the Arts’ Public Art Network Year in Review as one of the top 50 outstanding public art projects from across the country in 2017. Partners: Mural Arts Philadelphia, The City of Philadelphia; The Office of Arts, Culture and the Creative Economy; and Friends of Vernon Park. The Battle Is Joined was presented as a part of the Monument Lab: Philadelphia (2017) exhibition. I am covering the Battle of Germantown Memorial with a structure that is constructed using mirrored acrylic. I believe that the physical shrouding of the monument with a reflective surface will allow the sculpture to feel expansive, accessible, and less intimidating than its colossal stature and material weightiness currently permit. The ability to see oneself in the monument would lead us to consider the piece as a living/breathing monument that is not static or staid, but as one that reflects today’s America and our current political and social moment. Monuments are established with the assumption that we as a nation have collectively decided that something should be remembered, honored, and celebrated. In reality, we don’t have equal voices in this mandate, but in my insertion the intention will be for each of us to see and imagine our critical role in the ever-evolving American story. This object will feel undeniably alive—both solid and fluid, self-reflective and outwardly reaching, grand in stature yet utterly humble, reflecting our humanity. I think this “new” monument will be arrestingly beautiful, mysterious and thought-provoking, as the viewer ponders the connection between the park, the object on display, and themselves. My reinterpretation of the Battle of Germantown Memorial will ask the monument to serve as a conductor of sorts. It will transport, transmit, express, and literally reflect the landscape, people, and activities that surround it. We will be reminded that this memorial can be an instrument and we, too, are instruments—the keepers and protectors of the monument, and in that role, sometimes we become the very monument itself. This marker made of stone is ultimately ephemeral, as are the fleeting sensations and experiences of the park goers. But my goal is for these brief encounters with the monument to be indelibly absorbed. I also hope to disrupt the verticality of the monument through the different axes and orientations the mirrored surface will create. I want the sculpture at moments to feel uncanny, particularly for my Germantown neighbors who’ve most likely walked by this monument countless times, perhaps registering it only marginally after repeat encounters. I hope the familiar (monument) will become strange as a park goer sees the world around, above, and behind her reflected directly before her—allowing or imploring this viewer to acknowledge the present moment and the inherent memory and future it holds. Karyn Olivier (b. Trinidad and Tobago) has exhibited at the Gwangju and Busan Biennials, The Studio Museum in Harlem, The Whitney Museum of Art, MoMA P.S.1, The Museum of Fine Arts Houston, CAM Houston, The Mattress Factory, and SculptureCenter. In 2015 Olivier created public works for Creative Time in Central Park and NYC’s Percent for Art program. 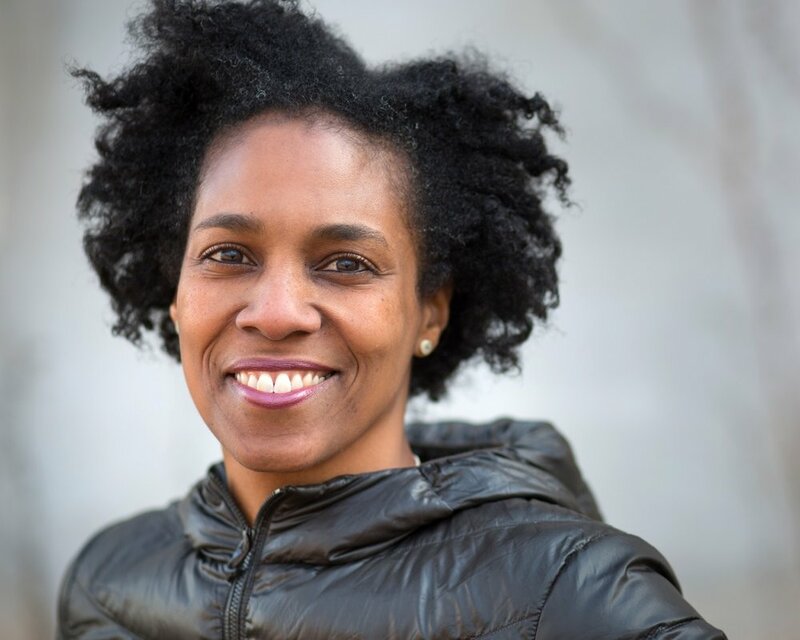 She is the recipient of the John Simon Guggenheim Memorial Foundation Fellowship, the Joan Mitchell Foundation Award, the New York Foundation for the Arts Award, a Pollock-Krasner Foundation grant, the William H. Johnson Prize, the Louis Comfort Tiffany Foundation Biennial Award, a Creative Capital Foundation grant, and a Harpo Foundation grant. Her work has been reviewed in The New York Times, Time out New York, The Village Voice, Art in America, Flash Art, Mousse, The Washington Post, Nka: Journal of Contemporary African Art, Frieze, among others. Olivier is currently an associate professor of sculpture at Tyler School of Art.